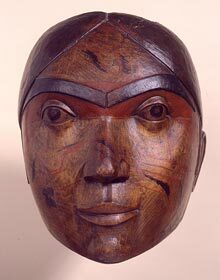 Large wooden Haida mask depicting a human face obtained by Frederick Dally. 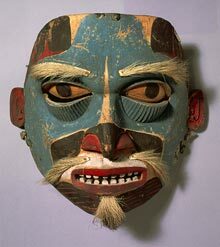 This mask was displayed at Bethnal Green Museum from 1876 and donated by Pitt Rivers to this Museum in 1884. Haida or Kaigani female mask obtained by Frederick Dally. This mask was displayed at Bethnal Green Museum from 1876 and donated by Pitt Rivers to this Museum in 1884. Many individuals contributed to the Museum as we know it today. This database shows collectors that are linked together by objects that have been passed between them. You can explore them by searching by name, career and by membership to various clubs. On each individual's record, related collectors are displayed. These are collectors that an object is known to have been passed between. By navigating through this set of 4,500 collectors and 5,500 relationships you can research these historical relationships for yourself. This resource was the result of a collaboration between members of the relational museum project and David Zeitlyn of the University of Kent. The Relational Museum project team has also prepared some information on all the students who studied for the diploma in anthropology between 1909 and 1945. The financial support of this project by the ESRC is gratefully acknowledged. Pitt Rivers Museum, South Parks Road Oxford.